Today's reader request ink is Monteverde Sapphire from the Gemstones collection. I purchased my samples of ink from Goulet Pens. Sapphire is a beautiful royal blue. In large swabs you can see two different colors of sheen-copper and green. Other properties: low shading, high sheen, and no shimmer. Ink swabs for comparison, left to right: Akkerman #5 Shocking Blue, Monteverde Sapphire, and Monteverde Ocean Noir. 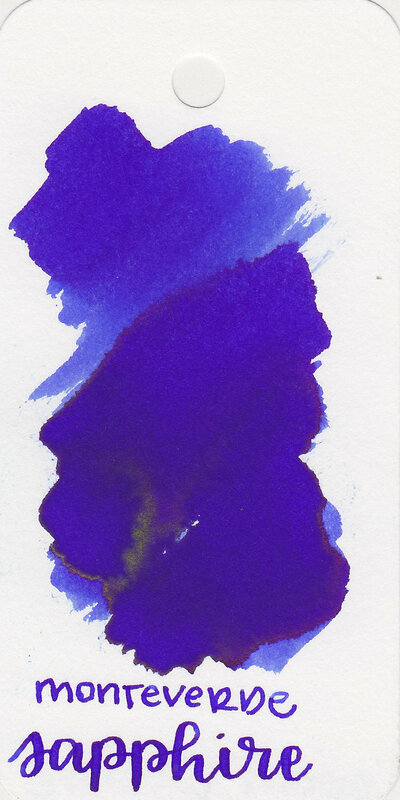 Click here to see the Monteverde inks together, and click here to see the blue inks together. Ocean Noir is a bit more vibrant than Sapphire. I used a medium Pelikan M600 White Tortoise on Tomoe River paper. The ink had a wet flow. Overall, I like this ink. The color is pretty, and it has a lovely wet flow. I love the dual sheen.